In medium bowl, mix chopped meatballs and barbeque sauce. Separate dough into 8 biscuits. Separate each biscuit into 2 layers; press each to form 4-inch round. For each bao, spoon about 1 tablespoon meatball mixture onto center of each dough round. Bring edge of biscuit together, pinching together in center to form pyramid. In 5-quart Dutch oven, heat 1 inch water to simmering. Spray metal colander with cooking spray. Arrange 5 or 6 bao in bottom of colander, about 1 inch apart. Reduce heat to medium-low; place colander in Dutch oven, and cover. Steam 20 minutes. Transfer bao to serving plate; cover to keep warm. Repeat with remaining bao. 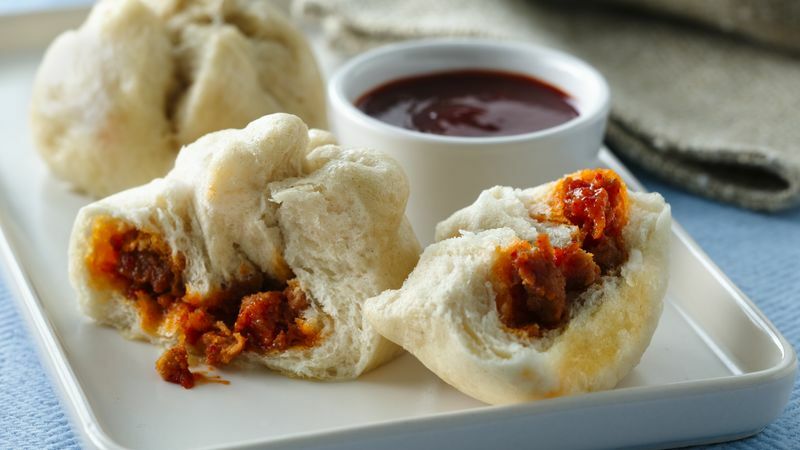 Serve bao warm with additional barbeque sauce. Korean barbeque sauce can be found in the Asian foods aisle of the supermarket. If you can't find it, a traditional barbeque sauce can be used. Be sure to add a little spice to the sauce by adding a teaspoon of Sriracha sauce.